You are here: Home / / Chicken Panang Curry (30 Minutes!) + Video! Chicken Panang Curry (30 Minutes!) + Video! This Chicken Panang Curry tastes better than your favorite restaurant at a fraction of the price with easy to find ingredients and on your table in less than 30 Minutes!! 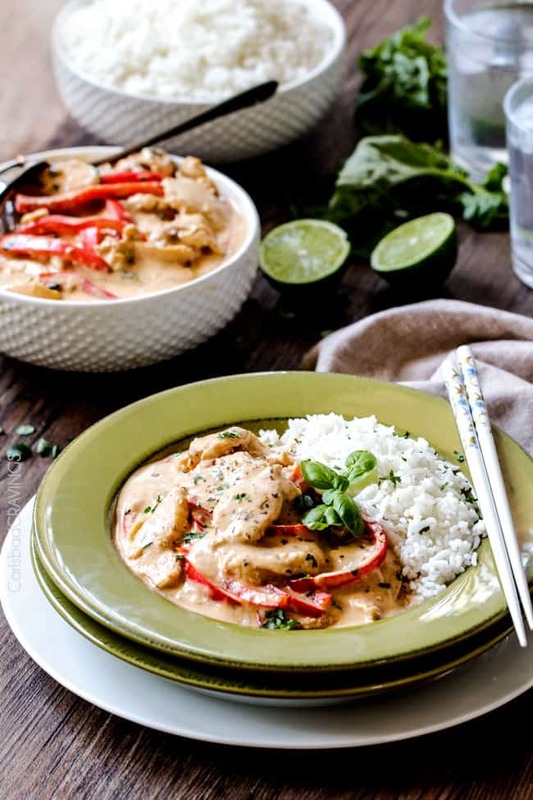 This Chicken Panang Curry Recipe is lusciously coconut creamy, bursting with layers of flavor, and all made in one pot! You will never need to order Panang Curry again! I hope you had a very Happy Thanksgiving! I have so much to be thankful for, especially as we celebrated my 18th lung transplant anniversary yesterday! I have now lived longer with my new lungs as I did with my diseased ones thanks to continuous miracles. I posted a little about it on Instagram HERE. When my husband saw the photo, he said, “oh, that’s graphic!” But I wanted to share just how miraculous of a journey it has been for which I am grateful every single day! I truly believe we are only as happy as we are grateful, and to me, everyday is Thanksgiving. Thank you so much for enjoying this journey with me and for your continuous support!So while Chicken Panang Curry might seem random to share along with my lung transplant anniversary, the two actually belong together because I either order Chicken Panang Curry or Chicken Pad Thai at almost every double lung transplant anniversary from my my favorite Thai restaurant. But NOW we can all make Chicken Panang Curry from the comfort of our own homes! What is in Panang Curry? 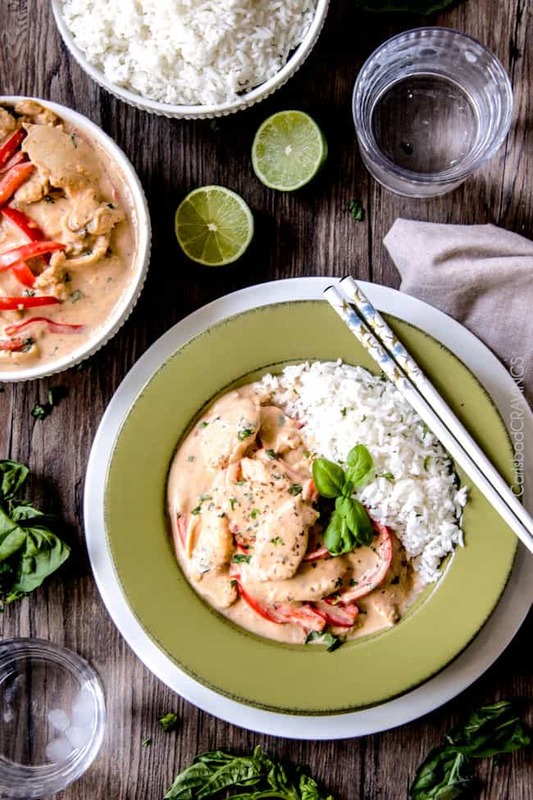 Traditional Panang Curry is characterized by its thick creamy coconut milk base with splashes of lime, kaffir lime leaves, phanaeng curry paste, palm sugar, fish sauce and either shrimp or thin strips of chicken. I have been making my own version of Chicken Panang Curry at home for years now, and you will be amazed at how much this tastes just like the restaurant version – if not better than most. When I was perfecting my recipe, however, I found my local stores did not often carry the authentic recipe ingredients of palm sugar, Kaffir lime leaves and Thai basil leaves. So after research and experimenting, I came up with my own “pantry friendly” version using easy substitutes. Kaffir lime leaves can be substituted by lime juice, bay leaves and dried thyme and palm sugar can be substituted by brown sugar. What is Panang Curry Paste? The only ingredient you might have to order or purchase at a specialty store to make this Panang Curry recipe is Panang Curry Paste (I use this Panang Curry Paste Mae Ploy) because Panang Curry Paste puts the PANANG in Panang Curry! 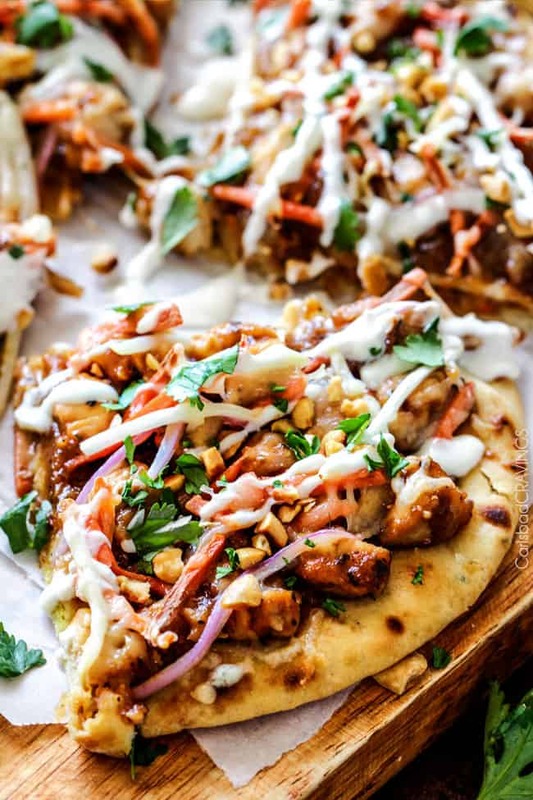 The Paste is an explosion of flavors comprised of roasted peanuts, galangal, kaffir lime leaves, lemongrass, shallots, garlic, serrano chiles, and cumin – all gathered and ground for you! winning! The main difference between Panang Curry paste and Red Curry paste is Panang paste contains ground peanuts. It is also less spicy and slightly sweeter than red curry. But one thing they do have in common is tons of flavor with minimal effort. 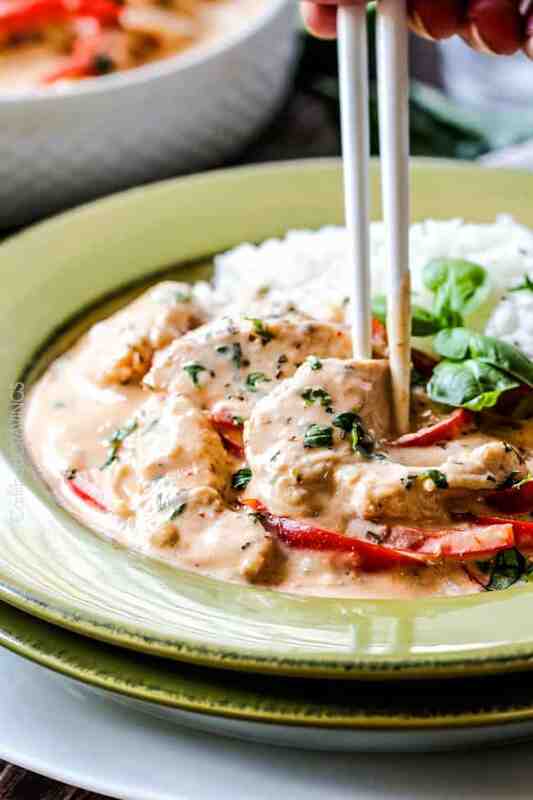 You will be shocked at just how quick and easy this Chicken Panang Curry recipe comes together once you have your paste. Another bonus is once you have the curry paste, it stays good in the refrigerator for some time so you can make your very own Chicken Panang Curry straight from your pantry anytime you feel like it – which will be very often.As in all curry pastes, the key to unlocking the flavor is to is to saute it oil along with garlic and ginger. Next, we stir fry our chicken directly in the simmering Panang Curry Paste so it soaks up all the dynamic flavors before we add the coconut milk.Next, my authentically blasphemous key to gorgeously, thick, silky coconut sauce is to whisk our quality coconut milk (I like Chakoah) with a little cornstarch. The end result is a rich, luscious coconut sauce that is soooo creamy. As Panang Curry sauce should be. We then spike our coconut milk with sugar, fish sauce, lime juice, a bay leaf, dried thyme and salt. The lime, bay leaf and thyme are a pantry friendly substitute for kaffir lime leaves that tastes beautifully authentic. We simmer our coconut sauce for 5 minutes to thicken and concentrate the flavor then add our bell peppers and basil and simmer 2-3 minutes or until peppers are crisp tender. That’s it for wonderfully coconut creamy, EASY Chicken Panang Curry! Feel free to customize this Chicken Panang Curry recipe with whatever veggies suit your mood or use this Chicken Panang Curry to clean out your veggie drawer. It will be the most deliciously epic mash of veggies ever. You can also substitute the chicken for shrimp or tofu. You can serve it with noodles, rice or zoodles. You can add additional lime juice or sriracha. The customization of this Panang Curry is endless! And so will be your love. Want to try this Chicken Panang Curry Recipe? This Chicken Panang Curry tastes better than your favorite restaurant at a fraction of the price with easy to find ingredients and on your table in less than 30 Minutes! This Chicken Panang Curry Recipe is lusciously coconut creamy, bursting with layers of flavor, all made in one pot! You will never need to order Panang Curry again! Heat oil over medium high heat in large nonstick skillet. Add curry paste and saute for 1 minute. Add sliced chicken and cook just until chicken is no longer pink. Add ginger and garlic and saute 30 seconds. Add 1 1/2 cans coconut milk. Whisk cornstarch into remaining 1/2 can coconut milk then add to skillet. Stir in sugar, fish sauce, lime juice, bay leaf, thyme and salt. Simmer for 5 minutes then add red bell peppers and basil and simmer 2-3 minutes or until peppers are crisp tender. Discard bay leaf. Garnish with additional optional fresh basil, lime juice and Sriracha to taste. Serve with rice. *2 tablespoons is medium-spicy - about a 4 spice level on the Thai 1-10 restaurant scale if using Mae Ploy brand. I have found Mae Ploy to be a little spicier than other brands so it is possible that 2 tablespoons other brands might just be medium heat. You can always use less Panang curry paste and add additional Sriracha/Asian hot chili sauce to taste at the end of cooking. That being said, I found when I used 1 tablespoon Mae Ploy Panang Curry paste it was lacking flavor for my taste. **Chicken is much easier to slice if partially frozen. It will thaw quickly once sliced. ***You can slice your chicken and red bell peppers in advance for even quicker meal meal prep. Congratulations on your lung transplant anniversary! You are such a source of strength and inspiration! And the Panang Curry looks delicious! Thank you so much Marie, you are so sweet! I so appreciate your kind words! All the best to you and yours! I always order Panang Curry so I am SO Excited to try this! Thank you!! I am excited FOR you Dee! I think you will absolutely love it! Enjoy! I have been looking around at other recipes until finding this one and very keen to try it! Can i ask how you would cook it normally if you have access to all the hard to get ingredients (eg kaffir lime leaves and palm sugar)? I have access to pretty much any Asian ingredient and want to make it the best possible! Hi Jamison, sorry for the delay as I had surgery this week but thanks for your comment. I would substitute the brown sugar with 2-3 tablespoons palm sugar as it is stronger than brown sugar. I would substitute the bay leaf, dried thyme and lime juice with 7 kaffir lime leaves, 3 torn into pieces, and 4 finely shredded (discard the stems) and then add lime juice to taste if needed. Hope this helps! Have you ever tried freezing the curry after you prepare it? The Internet is giving me mixed reviews on freezing coconut milk. Hi Becky, unfortunately coconut milk tends not to freeze well – the milk proteins and fat separated from the liquid, much like what happens when you freeze buttermilk. Sorry! Can this be done in a slow cooker? If so what changes would I need to make? Hi Claire! I have never tried this in the slow cooker but is should work great – it just might not get as creamy. I would add all of the ingredients except the bell peppers. You can even add the chicken whole and chop when cooked. Add the bell peppers the last 30/45 minutes and cook on high until crisp tender. Enjoy! I have made this twice now, and let me tell you. It is DELICIOUS. It is SO creamy and decadent. I have also made this recipe once using all the ingredients as listed but I had to sub regular red curry paste, as the ONLY Asian food market in this area keeps unreliable hours and was closed. It was still very good! This recipe is so quick and easy but it tastes like I spent hours on it. It is definitely a favorite. Hi Teri, I’m thrilled you love this recipe so much because it is one of my absolute favorites ever! you have great taste 🙂 I’ll have to give it a try with red curry paste some time, you’ve totally peaked my interest! My sister turned me on to your site and this is the first recipe I made. I have been to Thailand multiple times (even taking a cooking class one time!) and this is still one of the best Panang curries I’ve ever had! I bought the large container of paste, so I look forward to making this every week until my family is sick of it 🙂 Next I’ll have to try your pad Thai. 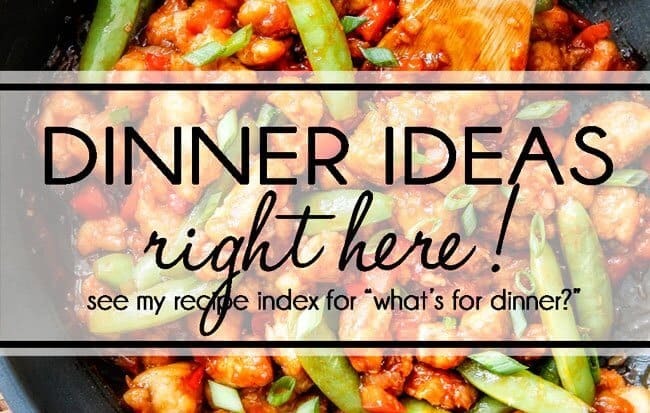 I’ll have to check if you have a pad see ew recipe, that’s my other favorite! Thanks. Welcome to my site Rachel! I absolutely love your comment and am super flattered this is one of the best Panang Curries you’ve ever had! I hope you love the Pad Thai equally as much! I don’t have a recipe for Pad See Ew yet, but it’s coming! My search is finally over!!! This recipe is amazing and has people asking me to have Thai night at my house. This tastes even better than my local Thai restaurants and we used to order Panang curry at least twice a week. I do make some minor adjustments. I use 2 cans Coconut Cream and one coconut milk. Add an extra TBS of Cornstarch. I used 6 ounces of palm sugar with 1 TBS of Coconut Sugar. 15 lime leaves (which I remove after simmering about 10 minutes). I put lots of vegetables (Broccoli, Zucchini, Carrots, Shallots, Peppers…today I’m trying Cauliflower and next time I’m trying Japanese Eggplant). This is sooooo good!!!! Thanks Jen for changing my life!!!! Thanks for your awesome comment Dave! I am thrilled it is such a favorite and better than your local Thai restaurant! The additional coconut cream sounds divine and I love how you have played with so many veggies – yum!!! I had never had this dish before but the pictures looked so good, I had to try it! I had a hard time finding the paste and ending up getting it off Amazon. I thought it was delicious and so did my husband! The kids thought it was a little spicy though, but that’s typical. Thanks for the great recipe! Hi MC! I LOVE that you wanted to try this recipe even though you haven’t had it in a restaurant before but more importantly I’m thrilled it was a hit! Thank you! I have a recipe for Panang Beef Curry that I love, so I almost didn’t try this, but I’m so glad I did. This was SO good. It was so different from the beef curry; almost like two completely different recipes. I didn’t know about the cornstarch but added it anyway; I think it helps since there are so many bell peppers. All of the bell peppers didn’t fit in my huge skillet but I should have added them anyway, because they did end up cooking down a bit and it would have been fine (I used 2 red, 1 orange). I sliced the bell peppers in the morning and this came together quickly at dinnertime. Thanks for sharing this. Looking forward to trying your other Thai recipes. Welcome to my site Michelle, I’m so happy you loved this Panang Curry so much! I LOVE Thai food so I hope you enjoy exploring my recipes! Amazing! I have been trying for ages to make a curry that wasn’t just meh. This was the kind that makes me just want to chug the sauce. Delicious. I used thai green curry paste, not panang, but I will try that next time as it is my favorite. I ran out of brown sugar so I subbed white sugar with molasses and it worked great. Thank you, thank you, thank you! WAHOO! Thanks so much Amanda! I love hearing you love this curry as much as us! I have lots of curry recipes with great flavors, so I hope you can get your curry fix!